Years ago, my boyfriend and I decided to begin collecting corks from special moments in our lives and writing short notes on them to remember the occasions. There came a point when we realized we had to actually DO something with all of the corks we were collecting, so I started moving them to a plain shadow box that has (until now) remained untouched. Finally, it was time to show off these memories we'd made! Our DIY cork memory box contains corks from big milestones, special occasions and holidays over the past few years and sits proudly on a bookshelf to remind us of the things we've celebrated together. Best of all, it's easy to make yourself! I like a properly matted and framed piece of artwork as much as anyone, but sometimes, it can be a little overkill. First off, it's expensive, especially for large pieces, and secondly, it doesn't always fit the style of the art. Framing a poster or screen print can often make the space feel more like a weird movie or record exec's office, rather that a home filled with awesome art. Whenever I find any large, vintage art, I'm especially struck by the bold graphic design and aged colors and texture. For something like this, a classic frame would be way too expensive, and not the right fit, design-wise. So, I took a cue from the classic pull-down maps of my elementary school classrooms, and created a simple way to hang it on the wall with a lot more character. This month we've been teaming up with our friends at True Value, my local neighborhood hardware store, and I think this project shows off how you can come up with a great, stylish-looking final project using simple materials and just a few tools. How To: Make Your Own Oversized Picture Frames -- For Cheap! Having artwork or photography custom framed is expensive -- there's no way around it. Having a giant piece of art framed? Well, you may just have to sell your first born. With this simple DIY framing project, though, you can save your progeny and your pennies and still have some fantastically framed artwork! When one gal had spare PVC in her backyard after installing a sprinkler system, she turned excess into success. When my husband and I moved from Chicago to Houston last year one of the things we looked forward to was trading our small condo for a larger home. Now we have double the space and lots of rooms to decorate. In the living room I really wanted to find a piece that was original, interesting and would make a big statement. 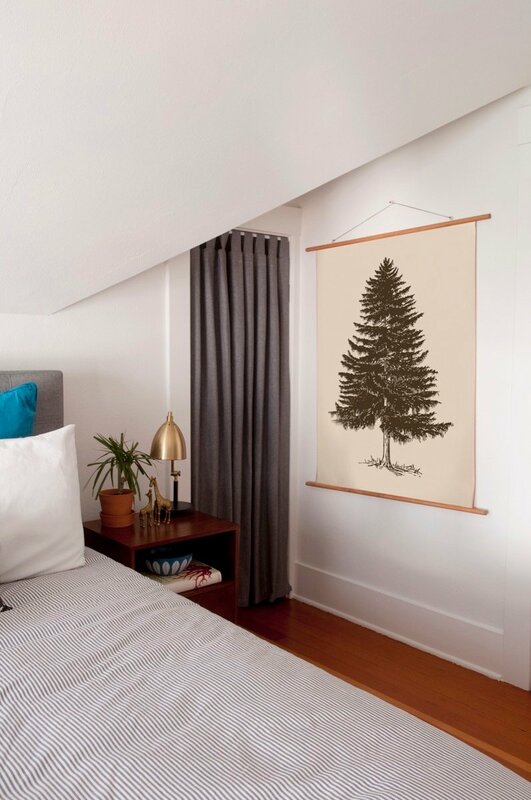 Ultimately I was inspired by photo I found of designer (and HGTV Design Star winner) Emily Henderson’s home on Apartment Therapy that featured a large flag stretched on a wooden frame. To celebrate the release of Make It! Hardware Store Decor, we decided to look back into the Curbly archives to find some great hardware store-inspired posts. First stop, this Curbly video showing you how to make an easy and inexpensive custom poster frame. An attractive frame for artwork always beats thumbtacks or the sticky stuff, but custom jobs at the framing shop come with sky-high prices, often more than you paid for that wonderful screen print from Etsy or the perfect vintage concert tour poster. So, skip the frame shop altogether, and head to the hardware store for this easy and customizable DIY to protect and showcase your favorite pieces. Don't dig on the industrial look of the exposed plywood? No worries. Just cut your substrate to the same size as your art, and you're as clean and contemporary as can be. Last week I posted a Super Simple Floating Frames tute that resulted in a leftover frame sans glass. Then, this week, I posted about my adventure at my local surplus store and mentioned something I'd found there that inspired a how-to. Today I combine the two and show you how to make a Frame Vase. A Table that Folds Up into Picture Frame when Not in Use. When living in a small space, it can be tough to give up valuable floor real estate for a dining table, especially when you can just eat on the floor. Or the couch. Or in bed. Or, admit it, over the kitchen sink. Candy over on Junk Market Style scored a vintage ceiling tile at a flea market for 2 bucks. She decided to frame it with the help of rummage sale frame and some snot dots. The result is a very easy floating frame installation. Pattern Tape for Awesome DIY Picture Frames. I don't know how it happened, but somehow, I ended up on the HappyTape blog, subtitled "pretty, pretty tape, imported from Japan." Apparently, some cats in Japan are making some amazing patterned, re-stickable tape, and it's going by the name...you guessed it, Japanese tape. An attractive frame for artwork always beats thumbtacks or the sticky stuff, but custom jobs at the framing shop come with sky-high prices, often more than you paid for that wonderful screen print from Etsy or the perfect vintage concert tour poster. So, skip the frame shop altogether, and head to the hardware store for this easy and customizable DIY to protect and showcase your favorite pieces. New to Photojojo is their Photoshop Photo Frame. Trimmed with features such as scroll bars and gray and white checks and everything else found on a standard Mac OS X Photoshop window. How to make reused glass frames. Shannon Quimby was ruminating over some windowpanes leftover from a French door and came up with this slick framing project, the cost of which set her back about a dollar. Two pieces of leftover glass--either from an old French door, windowpane or even from unloved picture frames. An eyelet picture frame hook.